Representatives of Fusion for Energy presenting the ITER project. The European Research and Innovation Exhibition - otherwise known as Salon Europeen de la Recherche et de l'Innovation (SERI) (See more here) - was hosted in Paris between the 6-8 June at Expo Porte de Versailles. 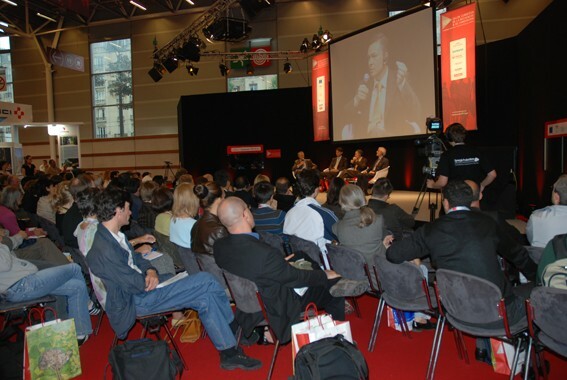 The event brought together more than 25,000 visitors and 360 exhibitors from the field of research, education, industry, science communication and policy offering them the opportunity to debate the challenges that European research currently faces. The Environment was this year's theme and the guest of honour was Finland, one of the leading EU member states in terms of R&D investment. SERI also proved to be a suitable occasion to raise awareness about EU research. With more than 100 debates and round table discussions taking place, the European Domestic Agency for ITER, "Fusion For Energy", was invited at the exhibition's TV set in order to explain the merits of fusion and present Europe's involvement in the ITER project. Didier Gambier, Director of Fusion for Energy, offered a rare insight on the politics and diplomacy behind fusion research and commented on the challenges that our world economy will increasingly face if we do not take action and invest in a new energy mix. Glenn Counsell, Fusion for Energy Diagnostics Group Leader, explained the science behind fusion and was confident on the prospect that fusion will become a viable source of energy. Werner Gulden, Fusion for Energy Safety Group Leader, finally stressed the importance attached on strict safety standards and explained the way ITER takes into account environmental concerns.